With Veeam and Hewlett Packard Enterprise (HPE) you get unique capabilities by integrating Veeam features directly with HPE's primary and data protection platforms. Veeam Explorer for HPE Storage Snapshots is offered for the following environments: HPE 3PAR, HPE StoreVirtual, Nimble Storage AFA and Nimble Storage CSS. Veeam Explorer for Dell EMC Storage Snapshots is offered for the following environments: Dell EMC VNX, Dell EMC VNX2 and Dell EMC VNXe. Veeam and NetApp have teamed up to provide high-performance storage with reliable data Availability solutions designed for virtualized environments. Veeam Explorer for NetApp Storage Snapshots is offered for the following environments: NetApp FAS, NetApp FlexArray (V-Series), NetApp Data ONTAP Edge and IBM N-series. Veeam Explorer for IBM Storage Snapshots is offered for the following environments: IBM Storwize family, IBM SAN Volume Controller, IBM Spectrum Virtualize and IBM/Cisco VersaStack. Veeam Explorer for Storage Snapshots lets you perform granular recovery for VMware vSphere VMs directly from the world’s leading storage vendors. 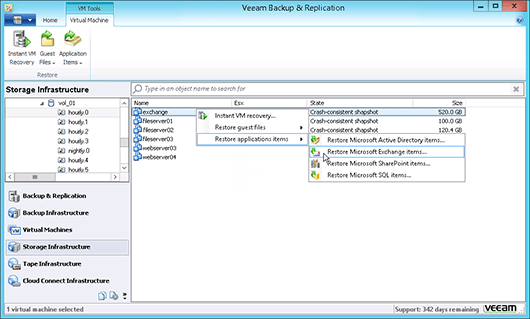 And it’s easy to use — just a few clicks in the Veeam Backup & Replication™ interface and you can restore directly from storage snapshots. 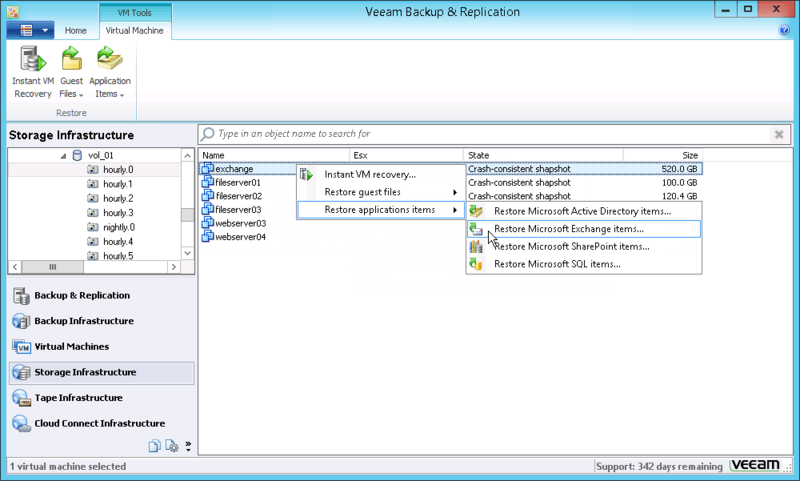 You can also enjoy the functionality of Veeam Explorer for Storage Snapshots by downloading NEW Veeam Backup & Replication™ Community Edition. With ships sailing all around the world it is important for Norwegian to feel confident that we have the very best backup and recovery systems in place. Meeting RTOs and RPOs is not a concern because Veeam lets us recover VMs, files and individual items in minutes, saving time and eliminating risk. It would probably take longer to contact people and let them know we recovered a VM than it takes to actually recover a VM. We needed the best data protection for our production environment, and Veeam offers frequent and reliable backup, storage integration, a smaller storage footprint, high‑speed recovery, replication for failover and improved monitoring and reporting. We didn’t have to make any hardware investments, and Veeam integrates seamlessly with HP StoreVirtual.